If you run a business, you want to build your email list. Even if you think you business can’t really benefit from keeping an email list (wedding businesses suffer from this thinking: “My clients are just one-time clients… I don’t really NEED a list!”), trust me: You HAVE to. Fun Fact: For each person on your email list, you can expect about $1 in return per month. 2,000 on your list? $2,000/month. 10k? $10k. 50,000 subscribers? $50k. So on and so forth. Now there’re tons of ways to build your list, but here are three that work EXTREMELY effectively- I use these exact method to grow mine. Your landing page should be EXTREMELY simple and easy to understand. Some compelling body copy that shows off the benefits of said Handraiser. A place to collect the email. That’s it! Pretty simple stuff. I’d also recommend removing the option for the reader to go elsewhere on your site by removing the top menu from that particular page- take away the ability to click around before they decide on whether they want to learn more or not; this is a basic customer-filtering tactic. Besides a landing page, you probably have other areas on your site where you collect emails. This is the absolute most boring, lazy call to action you can make. Who wants to join another newsletter from a company trying to take someone’s hard-earned money? Who cares about getting updates from your company? No one. Readers subscribe to a list because they know THEY’RE going to get something out of it- valuable information that’s going to make their lives/businesses better, or resources that can make them happy, healthier, wealthier, so and and so forth. Because of this, you have to sell the Subscribe button. It doesn’t have to be anything earth-shattering- just get specific about those “Latest News and Update” features. 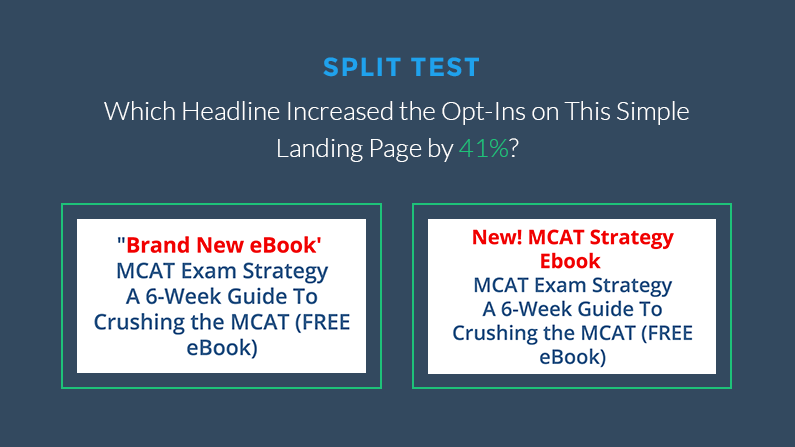 Finally, make sure you’re split testing the headlines on your opt-in pages/areas. If you don’t know what “split-testing” (or “A/B Testing”) a headline is, it’s writing two different headlines for an ad/post/subscription box/etc. Then, you show 50% of your readers one headline and 50% the other (which you can do through various plugins like Optimizely or even using Google’s own A/B testing software). What you’re doing is seeing which headline will cause more people to subscribe to your list (and yes, there WILL be a clear-cut better headline). This doesn’t take long either- get about 50-100 visitors to that page of your site, and a clear winner will start to reveal itself. You can split-test (or A/B test) anything- from headlines, to button text, to even button color; they all can make a difference. * Quick Note: Unless you’re getting hundreds of thousands of visitors a month, though, I would only focus on split-testing two main things: images on landing pages and headlines. Anything else requires more traffic than you’re getting to get accurate measurements. So there are the three most-effective ways right now you can grow your email list, which generates you more leads, more revenue, and more clients. Put one of these into action today (I recommend the “Reason to Subscribe” text first; it’ll be the easiest and quickest to implement). WANT AN EXAMPLE OF A GOOD LANDING PAGE? Want to see my best-converting landing page I’ve created so far? Enter your email below and I’ll send it to you, along with notes and beautifully handdrawn charts and graphs about why it works- it’s pretty cool!